Dear Bride & Groom, welcome to Unique Ceremonies, the website dedicated to your symbolic wedding ceremony in France. We are delighted to hear from you & would like to take this opportunity to congratulate you on your wedding plans. 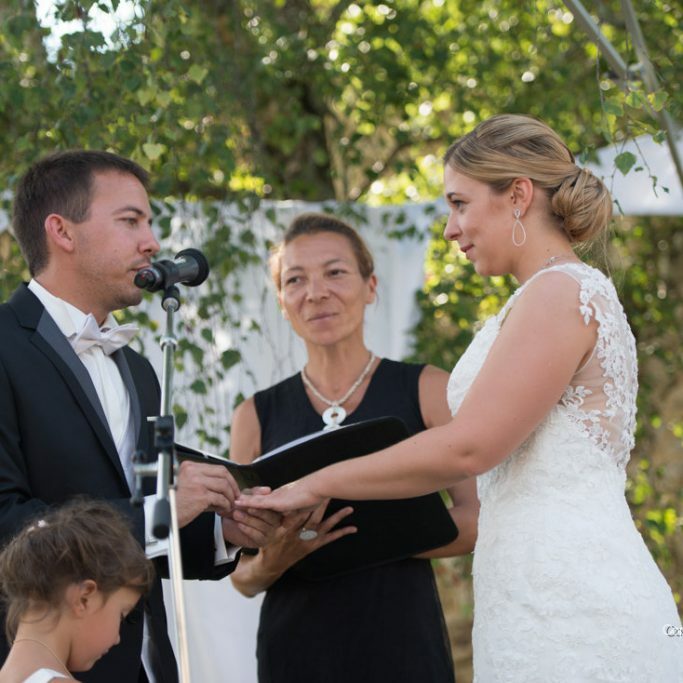 If we have the pleasure of your visit, you are probably thinking about having a symbolic wedding ceremony in France or a ceremony to renew your wedding vows and are looking for an English-speaking celebrant for your wedding ceremony in France. Maybe you already have a precise idea of the kind of ceremony you wish for and are looking for a professional wedding celebrant in France? Or you may wonder what a symbolic wedding ceremony actually is? Keep on reading for more details and check out our blog for tips and practical information! 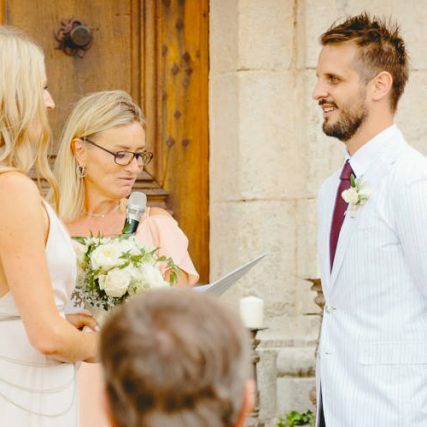 Founded in 2010, Unique Ceremonies specialises in the design and celebration of bespoke wedding ceremonies in France for couples who wish to use the services of professional and experienced wedding celebrants based in France. 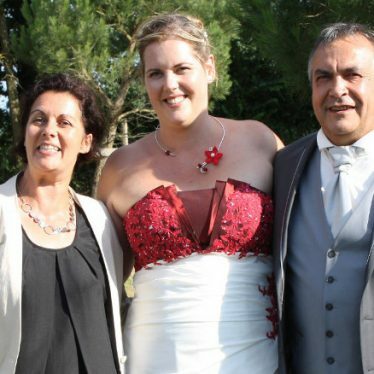 Magali, founder of the company, is based in the Poitou Charente region (Nouvelle Aquitaine) and offers her bilingual celebrant services mainly to an international clientele. Virginie joined the team in 2012 and also celebrates ceremonies in English, French or both in the South of France (Provence Côte d’Azur). Estelle has been officiating in French since 2014 in the Poitou Charente region. Richard, joined the company in 2016 and celebrates ceremonies in English. Perfectly bilingual, Rachel joined the team in 2017 in the Nouvelle Aquitaine region. 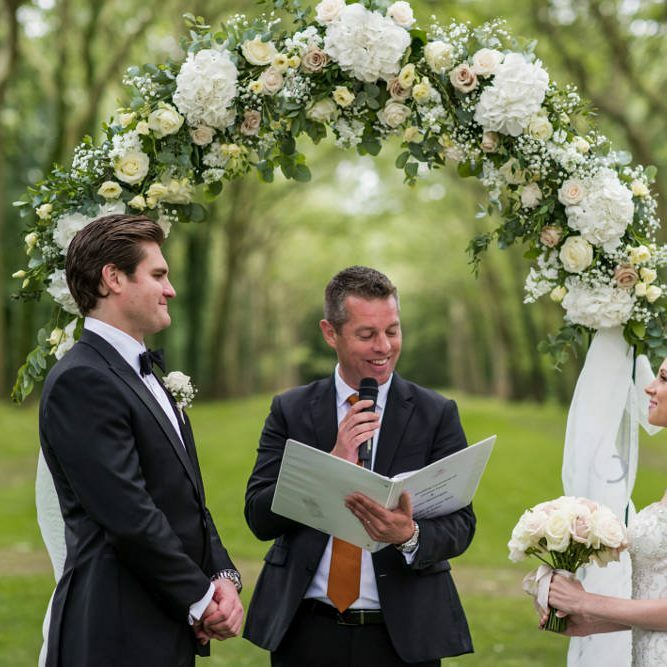 Finally, Sébastien is our brand new celebrant based in Tours who takes care of the French clientele. And this is just the beginning as we are constantly looking for new celebrants. Unique Ceremonies offers a truly personalised service according to your personalities, your tastes, your values, your story. As experienced celebrants, we know that your symbolic wedding ceremony in France is the opportunity for you to gather your loved ones and express your commitment to each other in front of them in a personal manner. We will use our skills and experience to design your dream wedding ceremony in France. Because we are professional celebrants, we also know that your symbolic wedding ceremony in France is the opportunity for you to express your commitment to each other in front of your loved ones in a special places. For that reason, Unique Ceremonies celebrants would love to compose for you a bespoke ceremony which combines tradition, originality, emotions and humour. You do not wish your ceremony to be any ceremony. You want it to be designed just for you. This is the reason why we create for you a ceremony which is tailored to your values, your cultural background and your circumstances. Unique Ceremonies celebrants like to take the time to get to know you and establish a trusting relationship to encourage you to share your story with us. Each of us has the skill and experience to put your emotions in writing with elegance, respect and humour. We are comfortable with public speaking and know how to combine presence, charisma and discretion in order to make sure that your ceremony goes as smoothly and naturally as it possibly can. Unique Ceremonies strongly believe that You are Unique and that your wedding ceremony in France should be just as Unique. If you dream of a bespoke symbolic wedding ceremony, contact us! 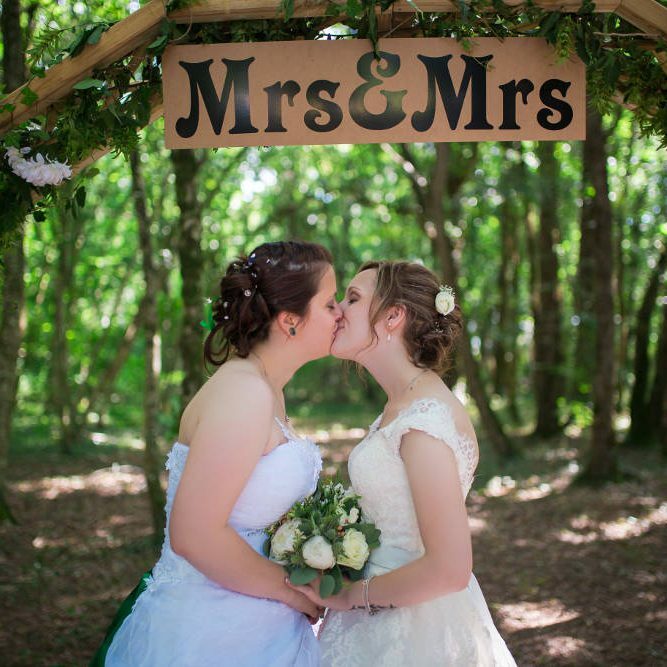 Unique Ceremonies, your wedding celebrants in France. We just need you to know that what you prepared will stay with us forever. It was ultimate sorcery, magical and perfect. We can’t believe what you managed! It was perfect how you involved the guest speakers in the ceremony. It was by far the best part of the day for us! We had an absolutely amazing day, it really was more than what I was hoping for. Rachel was brilliant, we can’t thank her enough for all the help and advice she gave us (she has the patience of a saint) and of course not to forget her hard work in created such a happy, emotional and funny wedding ceremony for us. We absolutely loved it and so did our guests, it was a ceremony none of us had experienced before. The whole service we have received from yourselves at Unique Ceremonies has been wonderful, there is not one thing can I think of that I wish was done differently. Steve and I cannot thank you enough. Virginie without question was nothing short of exceptional – she created the most intimate, unique, happy and deeply meaningful ceremonies that without doubt was my favourite moment of the whole day. We are blessed to have met her and eternally thankful and grateful to have an experience led by Virginie. We shall be keeping in touch for sure to renew our vows and to continue a great friendship. Service was 20/10!!! Thank you so much! Just simply so wonderful. We only have great praise for Virginie – she was fabulous. The pre-wedding contact and support was detailed and informative and she was very accommodating to any changes we wanted to make. She was so lovely and warm when we met her before the ceremony. The actual ceremony went smoothly and Virginie gave us just the right amount of direction. Following the ceremony we liked that she left the vows and documentation for us along with the thank you card and gifts and very nice touch. We can’t think of any improvement that may be needed. Virginie was such a star and we wish you all the best for the future of your business. Thank again for everything and to Virginie for making our day so special. We both enjoyed working with him and found him to be very professional and a lot of fun too. The ceremony was perfect and that is largely due to Richard. Magali, please thank him for us. We both couldn’t have been happier with the ceremony you performed for us. Everybody thoroughly enjoyed themselves and there were reports of a few “manly teardrops” in the audience ? I can’t believe you used my analogy of a turtle! ? That still brings a smile to my face. We had a great time travelling in France after the wedding, and we were quite sad when we had to come back to Southampton…. It was a pleasure planning our wedding with you and it makes us both very happy to know that you will continue your excellent work with more couples in the future. Please stay in touch and all the best for the rest of the wedding season. On behalf of myself and Claire, I would like to thank you so much for organising and performing such a beautiful wedding ceremony for both us and all our guests. Words can’t explain how amazing everything was. We thought the ceremony was the icing on an unforgettable weekend. Thank you so much for the effort you put into to writing such a personal speech. Our guests haven’t stopped telling us how amazing they thought you and the ceremony was. Thank you as well for joining us on the Friday night. It was great to get to know you a little better before the ceremony and great for you to meet all our friends and family. Thanks so much for being the most amazing celebrant! So many of our guests commented on how good you were, and how personal our ceremony was. We hope to see you again one day- please let me know if you would like me to write you a recommendation on a website. The ceremony & the whole day was perfect, couldn’t have done it any better! So many people said to me that it was the most amazing ceremony because of how personal & unique to us. Thank you so much for making it so special. Very happy – honestly couldn’t have been better. All guests either had a big smile on them or had tears running down their faces. The personal touch to the ceremony – it truly is unique. Also, We loved the secret texts from our loved ones. Very nice touch to a ceremony. What in your opinion should I improve? Working with you was an utter pleasure, the narrative about our lives together was beautifully constructed with fantastic communication both via email/Skype and the questionnaire. We felt that a religious ceremony truly wasn’t aligned with our values and Unique Ceremonies really provided a personal yet spiritual experience as it celebrated our lives and all the lives of those who have influenced and left lasting imprints on us. Thank you thank you thank you! It was a perfect day made ever more perfect with your words and ceremony. Visit www.awonderingstar.com – The third post down the page shares images and narrative from the ceremony. All the best Magali, and thank you again. We were so pleased with the ceremony and really enjoyed working with you both to bring to life our vision for it. We like that we were asked to fill out questionnaires beforehand so you could get to know more about us, our families and why marriage was important to us. We were really pleased that this all came through in the ceremony. It was also wonderful that you both were available to meet us when we were in France to talk through the ceremony in more detail including wet weather plans and other aspects that we thought went above and beyond. In addition to being extremely professional you were both friendly and a pleasure to work with so we wouldn’t hesitate to recommend you. A Celebrant, A Friend and an amazing support during a crazy and uncertain experience, when planning our wedding we knew instantly that we wanted to use Unique Ceremonies, Magali’s thoroughness and friendly and calm approach was a aesthetic we knew we wanted on our wedding day, throughout the process Magali became a huge support to us particularly when trying to source reputable suppliers and she was always on hand with a speedy reply for any queries we had, she was also very patient and understanding when it came to us getting information back to her even when it came to us only sending our vows through less than a week before the wedding. Magali goes above and beyond with every aspect which gave us a amazing wedding ceremony with lots of little surprises which kept it fresh and exciting for all involved, Magali’s calming influence also took away quite a lot of stress on the wedding day we found it very infectious and could not help feeling at ease too even on a day people find extremely stressful, and as she is such a pro at what she does everything went to plan with nothing but smiles and a few tears. Thank you so much Magali for helping us to make our dream wedding a reality it was more perfect than we could ever have hoped for and we will be eternally grateful. Thanks so much again for the fantastic ceremony, especially in difficult circumstances. All our guests were blown away by the approach and thought you were great. Many many thanks to you and Richard for our ceremony. We both thought it was lovely, and that it was just right in terms of the tone we were hoping for – relaxed/not too formal, and it was great that it was personalised. Some of our guests thought Richard must have been someone we knew given the way he spoke about us, and many commented on how nice they thought the ceremony was. The questionnaires we had to fill in were certainly long, but worth it for the tailored words we had as a result! We are very happy to hear from you…and yes, we are doing very well:-) We had a wonderful day and Virginie did a great job. So we were very pleased with Virginie’s service… thank you! We were absolutely amazed by your excellent services. We really enjoyed the ceremony, and we think Virginie managed to conduct the ceremony in our spirit: classy, but yet informal, relaxed and with a sense of humor. We particularly appreciated the planning process. Virginie and you were so organized, in control, took initiative and so engaged to make our day special. She had always the time to answer our questions, and she did it thoroughly. Also, that you were able to assist in decoration of the place where the ceremony took place, were highly appreciated. The organization in advance, and the coordination on the actual day was great, so that we could focus on other things, and we were always 100 % positive that we were in the best hands. We were both so amazed of her dedication and sincerity. You made us feel unique and special as a bridal couple. Thank you. We are happy to write a testimonial about you. Please instruct where to post it/ send it. Thank you so much for making our day special. We are so grateful.